The new addition to our line-up of calculators is the Roof Pitch Calculator. It will help you quickly calculate roof pitch based on the footprint of your roof. The calculator will also estimate total roof size, and the approximate cost to install new asphalt shingles or a standing seam metal roofing system. With this Roof Pitch Calculator, you can quickly calculate the length of your gable (length of the rafters). All you will have to provide is the ground dimensions of your roof (including the overhangs) and the roof rise from the base of the roof level to the ridge of your roof. Check out our guides for more information on how to estimate a roof and how to measure roof pitch. Another new feature we just added to the calculator is the ability to estimate installation cost for the 30-years Architectural Roofing Shingle, with more roofing materials to be added soon. First, you will need to do some leg work – that is grab a measuring tape and measure the outside dimensions of your house – corner to corner. If your roof has an overhang, and most roofs do, add the overhangs to your measurements in every direction. For example, if your overhangs are 6 inches, you will add a foot to the length and the width. Now, the terminology that we use in the calculator itself (refer to the image below). By width we imply the full measurement of your gable side, where the roof slopes. Length is the straight side – usually the front and back of your house. Roof rise: this one is a bit complicated. You will need to estimate off the ground or actually measure the distance from your roof’s ridge, down to the base of the house (see the roof measuring diagram above). If you choose to estimate the roof rise, all you have to do is count the number of rows of siding materials from the base to the peak or roof ridge. Now measure the exposure on each run of siding – most vinyl siding and clapboard cedar siding will have a 4″ exposure, so 3 rows will equal 1 foot. Add everything up, and don’t forget to add the width of the rake-board / fascia board to the total roof rise. Once you plug in the roof rise into the calculator, it will automatically calculate the pitch. You will still need to click the “Calculate Roof Pitch” button to get the rest of the results. 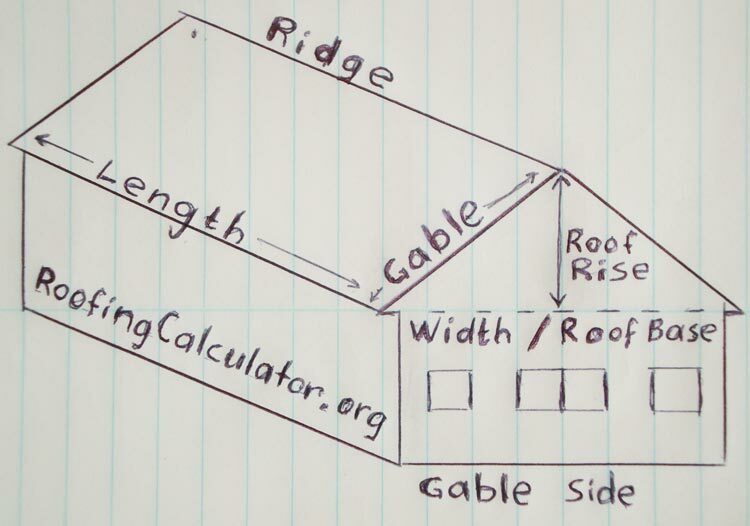 For more information on how to calculate roof slope and measure your roof, see the Roof Pitch guide over at Roof Pitch Calculator site. Also, do not forget to use utmost caution and safety if you decide to get on the ladder and measure your roof. We strongly recommend that you use fall protection at all times, if you plan to go on the roof itself. The Roof Pitch Calculator is designed to estimate the roof pitch and size for a rectangular shape, Gable roof only. Another limitation has to do with the approximate roof installation pricing – we will include only the 30 years dimensional shingles for now. The price does not include things like multiple skylight flashing, chimneys, plywood replacement, 2 or more layer tear-off, etc. The roof installation prices that you will see are for a simple gable roof with one layer tear-off, one chimney flashing, a few vent pipe boots, aluminum drip edge, ice and water shield, and a ridge vent installation. For a more detailed roofing price estimate, use our main roof calculator, which provides much more detailed pricing information, as well as a number of options, which you can change to get the most accurate estimate. We plan to improve the current features and add new ones, as we continue our work to bring you the most comprehensive, and easy to use set of roofing calculators. to $500 in tax credits. Some metal shingles are even sold in pre-assembled sheets, significantly reducing the amount of time it takes to cover the proposed roof surface. incorrect results. I’ve checked the results manually, using different inputs – no all is correct! 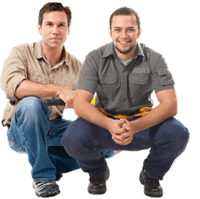 THIS IS THE BEST SITE FOR ROOFING INFORMATION. hi: This is Ken if I “include the overhang” on the gable end measurement the pitch comes out to 7.38 in 12 but I think it should be 8 I plan to build a cottage 24×24 feet, gable is 8 feet high with an overhang of 1 foot on sides and ends, I would like to have an 8/12 pitch, Please advise. I think your calculator is awsome, but I can’t get the sq ft area to come out right. the roof is 26′ at the base and 26′ long, the rise is 8′. so each side of the roof is 16×26 for a total of 832 sq ft, but your calculator comes up with 1001.75 sq ft. what am I doing wrong? Actually using the pure math, with 8′ roof rise (7.38 roof pitch), the gable side comes to just about 15.25′ – not 16. We will fix this soon, as well as do other improvements – make this roof pitch calculator more usable overall. We’ll do this just a soon as we finish developing Roofing Calculator iPhone app … and we will make sure thing like this do not pop into the app. nice diagram, hope you put more effort into your research on roof pricing structure !!! Pingback: How to measure a roof - easy guide to calculate roof size.